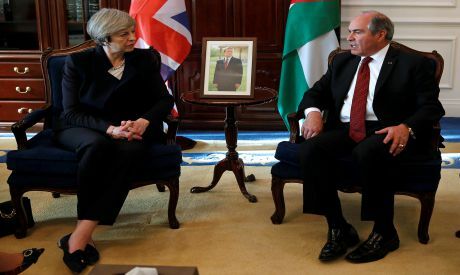 British Prime Minister Theresa May has begun a visit to Jordan where she is to announce plans to send more British military trainers to help the kingdom's air force in the fight against Islamic State group extremists. Jordan's royal court said Monday that May and Jordan's King Abdullah II toured a military facility, inspecting a rapid response force and a joint training program. May is on a three-day visit to Jordan and Saudi Arabia. In Jordan, she is to present a package of measures to boost cooperation between British forces and Jordan's air force. Jordan has carried out air strikes against IS targets as part of a U.S.-led military coalition against IS. IS controls parts of neighboring Syria and Iraq. The training is to take place in Jordan and Britain.